Amazed Parisians are still reeling after discovering billboardsÂ featuring President Sarkozy, pictured as U.S. President-elect Barack Obama, after Shepard Fairey's famous poster, with the wonders working comment Yes We Can! 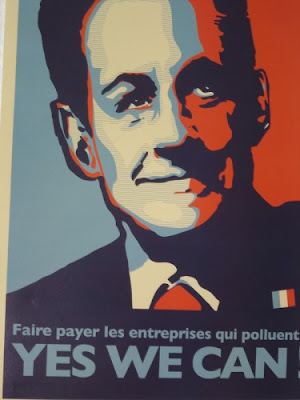 Des affiches reprÃ©sentant un portrait de Nicolas Sarkozy au-dessus de la mention “Yes, we can!”, slogan de campagne du prÃ©sident amÃ©ricain Ã©lu Barack Obama, fleurissent depuis quelques jours dans Paris. Un portrait peint dans les tons bleu-blanc-rouge du prÃ©sident franÃ§ais est reprÃ©sentÃ© sur chaque affiche et les mots “Yes, we can!” sont Ã©crits en rÃ©ponse Ã diffÃ©rentes questions telles que “Une Ã©nergie propre et durable en Europe?“, “Faire Ã©conomiser 1000 euro/an Ã chaque mÃ©nage?” ou “CrÃ©er trois millions d'emplois non dÃ©localisables en Europe?“. Des porte-parole au siÃ¨ge de l'UMP et Ã la FÃ©dÃ©ration de l'UMP de Paris ont affirmÃ© ne pas Ãªtre Ã l'origine de cet affichage sauvage. 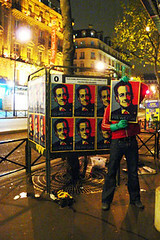 Posters featuring a portrait of Nicolas Sarkozy on top of the comment Yes, we can!, American President-elect Barack Obama's campaign slogan, have been spreading for a few days in Paris. 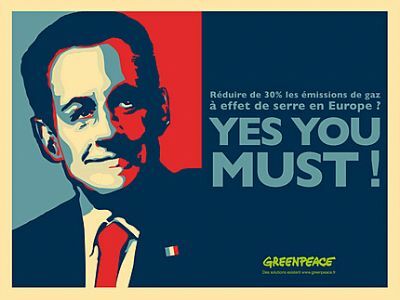 A portrait of the French president in blue-white-red tones is pictured on every poster and the words Yes, we can! are written as an answer to several questions, such as: Â«Clean and lasting energy in Europe?Â», Â«Allow every household to save 1000 Euro a year?Â» or Â«Create three million jobs in Europe that will not be relocated?Â». Spokespersons atÂ UMPÂ (the current majority party) headquarters and the UMP Federation of Paris claimed they did not initiate this campaign. Some cool stuffs, a blog about graphic arts, and more, follows up on the story, saying he wasÂ outraged. Un happening plutÃ´t original dans la dÃ©marche ! Surtout, en vous demandant de nous aider Ã le rÃ©soudre, nous savions vaguement que tout cela ne devait, au mieux, n'Ãªtre pas sÃ©rieux, au pire, entrer dans un subtil plan marketing. The areas where the posters were stuck were not chosen by chanceÂ […] All left-side, all Â«obamaniacsÂ». […] NGO Greenpeace's PR department, busy with another campaign, also denied to have initiated the operation. With hours passing, the action prompted comments ranging from thorough analysis to mere sarcasm. AndrÃ© Gunthert, from EHESS, an upscale research institution, writes under the title: Sarkobama, a meaningless picture ? Â anÂ in-depth analysisÂ Â from a “visual history” point of view. Rue.89Â underlined the parallelÂ drawn by the “Sarkobama team” between a “Black (or mixed race according to some)” and “a dwarf of Hungarian extraction.” Would things turn politically ugly? L'association Ã©cologiqueÂ [Greenpeace] a rÃ©vÃ©lÃ© ce matin qu'elle Ã©tait Ã l'origine de l'affichage sauvage, dans Paris,Â […]. Objectif: pousser les chefs d'Etat europÃ©ens Ã retoquer le plan Climat/Energie. Given who Obama’s putting into his Cabinet, I suggest we need to get ready to say “No You Don’t”. Commentators keep referring to Mrs Clinton’s experience — at what I ask? She’s never held a diplomatic post, she’s never worked as an academic in a relevant field, she’s not even been an intern at a foreign affairs think tank (e.g. Council on Foreign Relations), she’s never served in the military. So what it is that the commentators see as qualifying her to be SoS, surely not that she’s Mr Clinton’s wife . Obama’s economics team would seem to be populated with participants and cheerleaders for the very practices that have bought on the current financial crisis. So why should we have any expectations that they can even understand the causes of the crisis, let alone effect any remedies. Sarkobama! What a cool story.